Turnips are a low calorie source of potassium and vitamin C. Like other root vegetables, such as potatoes and rutabagas, turnips are usually eaten cooked. Values listed are for 1 cup of cubed, boiled turnips. Dietary reference intake, DRI, percentages are for women under age 50. One cup of boiled, unsalted turnips contains only 34 calories. The majority of these calories come from carbohydrates, of which there are 7.9 grams per cup. One cup of cooked turnips contains 4.7 grams of sugar and 3.1 grams of fiber. This is 11 percent of the DRI for a women following a 2,000-calorie a day diet. One cup of cooked turnips contains 1.1 gram of protein. This is less than 3 percent of the 46 grams of protein women need each day. While turnips do contain trace amounts of 18 different amino acids, they do not supply all of the essential amino acids so they are not a complete protein. Like most vegetables, turnips are very low in fat. One cup of boiled turnips contains only 0.12 gram of fat. One cup of turnips also contains no cholesterol. This is, of course, assuming the turnips are eaten without added butter or oil. If 1 tablespoon of butter were added to the turnips, it would add 11.5 grams of fat and 31 milligrams of cholesterol. Turnips are also low in sodium. One cup contains only 25 milligrams of sodium, which is less than 1 percent of the 2,300 milligrams you should limit yourself to each day. Again, this is assuming that no salt is added to the cooked turnips. If 1/8 teaspoon of salt were added, the sodium content would increase to 290 milligrams, which is more than 10 percent of your daily limit. Like many root vegetables, such as potatoes, turnips contain potassium. One cup of cooked turnips supplies 14 percent of the 4,700 milligrams of potassium you need each day. Potassium is important for nervous system and heart health. Turnips contain only small amounts of all other minerals, including less than 5 percent of the DRI for magnesium, iron and zinc. Turnips are a significant source of vitamin C. One cup provides more than 20 percent of the 75 milligrams of vitamin C women need each day. Vitamin C supports the immune system and works as an antioxidant. 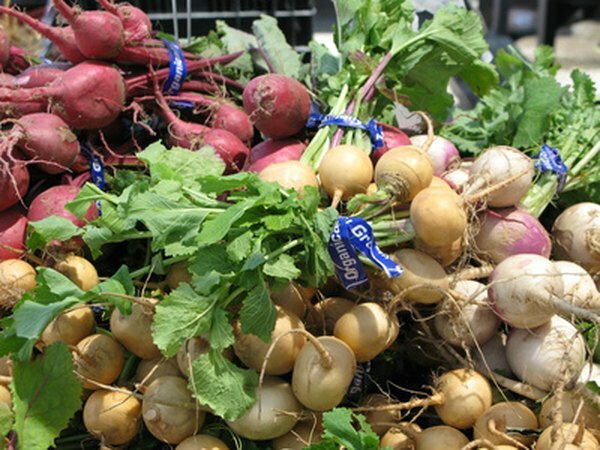 Turnips also supply 8 percent of vitamin B-6, but they provide less than 5 percent of the DRI for all other vitamins, including vitamins A, E and D.